What inspired you to create your own travel books for kids? How did you choose your first destination? The inspiration for my first book came from a personal need. We were planning a family trip to Cambodia with our three kids together with my sister’s family with 2 kids. 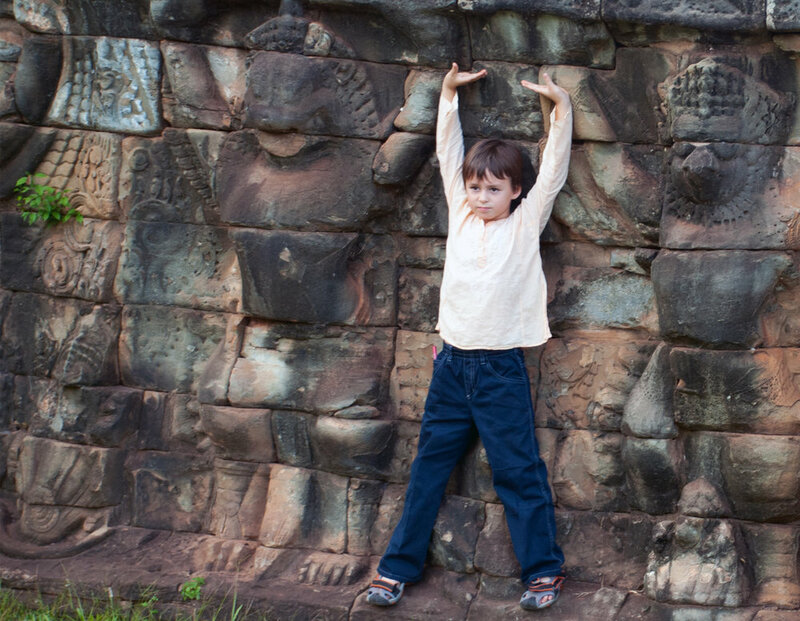 Visiting the temples of Angkor was an old dream of mine and I wanted to make sure that sharing that dream with 5 kids aged 8 and under wouldn’t turn into a nightmare. On paper, Cambodia is not the most kid-friendly destination, think weird food, no railing along the uneven steps of the temples, lots of temples, many of them in ruins, extreme heat and humidity, mosquitoes, etc. Making sure the kids would enjoy it as much as us was an obvious challenge. Since I could find no book on the subject for children, and I had time, I prepared a sort of travel journal for the children customised for our itinerary. I wanted to find something that would stimulate the kids in each site. The more I researched the bigger the journal became: how can I explain Angkor Wat without getting into Buddhism and Hinduism and then of course I had to give some history background. Then there was the food, the currency and each temple. A treasure hunt in Bayon followed an I-Spy game in Angkor Wat. Once I started researching, it was really hard to stop. You highlight the kid-friendly aspects of places that a lot of people consider too adventurous for families, such as India, Myanmar and Cambodia. What are some of the best tricks you've found for engaging children in a "grown-up" destination? That first experience taught me that there is no such thing as a non-kid-friendly place. Some countries are more challenging than others but it’s really about the attitude of the whole family. Everyone needs to be a little flexible: kids will understand that things are different when they travel. They might not find the exact same brand of yogurt that they have at home (or any yogurt for that matter) or the same sleeping arrangement when they travel and parents need to adjust their expectations when it comes to how many temples/museums will be seen on any given day. A few tips on those trips: 1 - Low- or no-expectation is the best way for everyone to have a good time. It’s a good skill (for everyone) to learn to go with the flow once in a while. 2 - It’s been very helpful for me to have the kids help with planning the days. When they are in charge, children feel empowered and are more involved in the activities (especially those that they chose). 3 - Structure the day with the kids in mind: start with the grown-up stuff (temple/museum) but plan the down-time: beach, pool, running around and playing tag in a park (in some countries, temples grounds are good for hide and seek, as long as kids remain respectful). 4 - For the younger kids, always have snacks: kids get cranky when they’re hungry and it’s not always easy/safe/practical to find a snack just when they need it among temple ruins. 5. Kids love to take pictures; giving the reporting job for a day to one of the kids is a very nice way to get them engaged. The older kids can use their phone/ipod and and disposable ones work well for the younger ones. If you had to pick just one, where is your favorite place you've visited? It’s really hard to pick a favourite but if I really have to choose in the most recent trips, Myanmar would be on top of the list. That was definitely the kids’ favourite so far. Where are you headed next? What's top of your travel wishlist? I’m working on two books, Vietnam where we just went and Mongolia, planned for October. After Mongolia, we are probably heading to south India in December. Which hotels have gone above and beyond for families? The Temple House in Chengdu, China, is amazing for families, their concept of the maxi bar, where delicious snacks and drinks are free (meaning, included in the price of the room :) as opposed to the mini-bar, is a genius idea for families. My kids’ favourites are the Novotel on Inle Lake in Myanmar and the Banyan Tree in Linjiang, China. What are some of your favorite secret spots you turned up? The cookies from the nuns in Madrid is my favourite but recently we’ve discovered cooking classes in Chengdu with a local chef that was amazing with kids as it included shopping in the local market before cooking and sampling the traditional Sichuanese dishes and kayaking in the rice paddies in Myanmar is on top of my kids’ list. You travel frequently but are based in Hong Kong. What's a perfect day in your adopted hometown for someone coming to visit? It’s a tough one because HK needs more than a day but within the limited time and with the children, I would recommend Victoria Peak (if the weather is good, otherwise you’ll just be in the clouds) and using the tram only on the way down (huge line on the way up): wet market of Central or Wanchai, walking around the streets of Sheung Wan for its contrasts: Man Mo Temple, designer stores and hip coffee shops and traditional Chinese medicine herb stores all in one neighbourhood, dim sum for lunch, high tea at the Peninsula Hotel for a taste of the bygone era of the British Empire, diner with a view on either side of the harbour with a ferry ride on the legendary “Star Ferry" at some point during the day or evening. And what about your original hometown of Paris? Any favorite restaurants or shops that you always visit when you're home? Yes, I grew up in Paris. Every time I visit I need to have a seafood plater at “Le Dôme” boulevard Montparnasse, my childhood neighbourhood restaurant and favourite oyster place. I also need a good couscous. I stock up on Kusmi Tea to alternate with Chinese Puer at home. I buy my perfumes from Serge Lutens and Francis Kurkjian. And for those of my kids who still wear size 12 and under I fill their closets with basics from Monoprix, Petit Bateau and Bonpoint. You're more experienced than most in handling kids - three of them! - while traveling long distances. Any tricks, tips or words of advice? The only word of advice I have is if you like to travel, don’t wait, just go and take the kids. If parents are relaxed about the trip, kids will be relaxed as well. Go with the flow, plan for things not going according to the plan and laugh about it. In our trip to Sichuan last April we visited a remote area with a gorgeous natural park (Jiuzhaigou) and were unexpectedly stuck in a minuscule airport for a whole day with a snow storm and no English speakers around (except our children). We ended up spending the night in a hotel in the middle of nowhere with the rest of the passengers on our flight. The kids will remember the best snowball fight ever in the grounds of a beautiful Tibetan monastery we got to see on the way and the most amazing 10-course meal in the hotel whose name I never found out. We, on the other hand, will not forget the negotiation our 8 year old had with the airline for our sleeping arrangements.